Front (2a), side (2b), side/rear (2c) and rear (2d) views of the Topf coke-fired double-muffle furnace installed under the New Hospital of Mauthausen KL. Its metal components were first sent to Auschwitz in August 1942, where there was talk of installing the furnace near Birkenau Bunkers 1 and 2, before they were finally sent on to their correct destination. It would appear that they were left in storage for over a year before the furnace was actually built in July 1944. It did not enter service until April 1945, and even then was used very little, or according to some sources not at all. 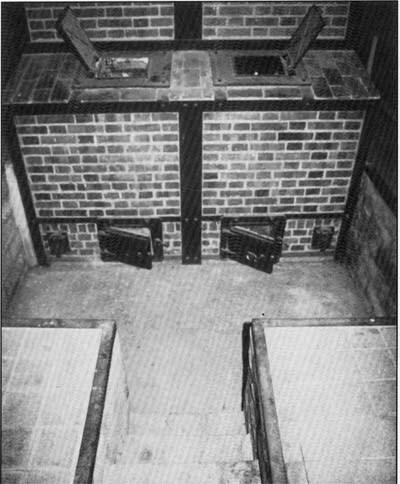 Photos 2b and 2c show the external part of the pulsed air duct leading to the crematorium muffle, but the blower and its motor have been removed. The place where they were installed can be seen on the floor below the duct, where the patch of cement contrasts with the tiled surround of the furnace. In the lower center on Photo 2b there is one of the secondary air intakes. There were six of these, their purpose being to cool the furnace if it tended to overheat (muffle temperature over 1100 C°). 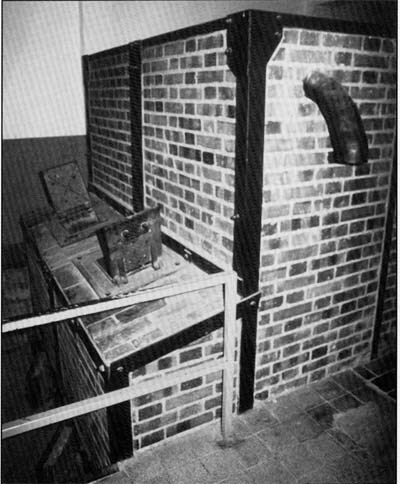 A furnace of the same model had already been ordered by KL Mauthausen from Topf in November 1940 for the Gusen subcamp. It cost 9,003 RM and entered service in January 1941. Its throughput is known from notes made by the prisoners in November 1941, when 600 corpses were cremated in a period of 12 days. This gives an average of exactly 50 corpses a day for the furnace, or 25 corpses per muffle, a rate of roughly one corpse per muffle per hour. This is a modest performance compared with Auschwitz Krematorium I, where the rate was a little over two corpses per muffle per hour. The ratios between the cremation rates of the double-muffle furnaces at Auschwitz and that at Gusen were between 2:1 and 3:1 and those between the three-muffle furnaces at Birkenau and the one at Buchenwald over 10:1. As the furnaces were virtually identical as regards design and construction, they must have had roughly the same performance, so that it is difficult to believe the extremely high rates claimed for Auschwitz-Birkenau. Knowing that the official cremation rates communicated by the Auschwitz SS to their superiors in Berlin (letter of 28th June 1943) were entirely theoretical, being obtained by calculation and intended above all to demonstrate the “efficiency” of the camp, it is necessary to correct them. Even reduced by one-third, the “official” figure is barely credible. The bragging SS usually multiplied the true figured by a factor of 2 to 5, and where comparisons are possible, division by something in this range brings the totally unrealistic into the realm of the possible.